On a Personal Note – Celebrating 30 Years! This August marked my 30th year helping my clients buy and sell real estate in Vancouver. My first cell phone was huge, mounted in my car with a lovely antenna out the back window. I carried a pager in my purse and the only way to communicate was in person or by phone. Today with so many ways to communicate, text, email, messenger, Facebook, LinkedIn, SnapChat, WhatsApp, WeChat, Instagram etc., I feel a lack of connection. I miss talking to people! My goal for year 31 is to get more face to face with people, my friends, my clients, my colleagues and the many contacts I have in the community. My career has spanned many life stages, first time buyer, move up buyer, starting a family, sending kids off to University, selling the family home and downsizing. I am now happy to announce my daughter Noelle is a graduate of The University of Victoria and her brother, Adam, is flourishing at the University of British Columbia and not far behind. I have had the privilege of working with you, my clients, in all of these stages in your lives and always look forward to hearing from you. Thank you for being part of my journey so far ………I look forward to talking to you soon. I remember early in my career my colleagues and I would always refer to The Eugenia at 1919 Beach Avenue as the “building with the tree on the roof”. The original pin oak was installed in 1987 as part of the Architect Richard Henriquez’s vision, a symbol of the forest that was there before. 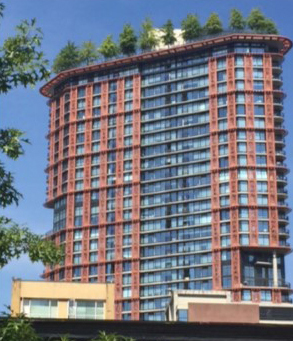 Today as Vancouver continues on the road to becoming the “Greenest City”, trees on the roofs of new developments have become a very common site and landscape plans are taken very seriously by the City of Vancouver. Vancouver’s Favourite Topic – “How’s the Market? No day goes by that does not include a news story and no social event would be complete without discussion about what is happening in the Real Estate market. Keep in mind the reports are general to Greater Vancouver which covers vast and various markets and Stats are old news by the time they are published. I specialized in the City of Vancouver and within the many submarkets. I have my finger on the pulse. The good news, we are for the first time in over a decade in a more balanced market, one that allows for negotiation, investigation and time for decision making. If you or anyone you know have been sitting on the fence or lost hope of being successful in the Vancouver Real Estate market, now is a great time to take a look.